Improving performance, meeting evolving environmental and quality standards, while assuring competitive edge in the Essential Chemicals market, is a challenge on its own. We have the technical expertise and market knowledge to meet these needs and deliver a wide range of sustainable and reliable essential?chemical products?to our customers. 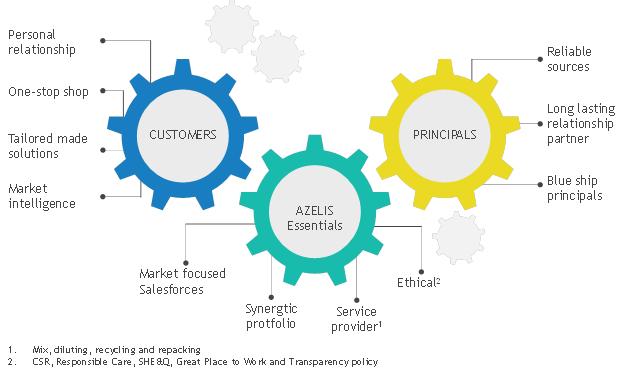 At Azelis we give our all to continuously create value. Our people?have the?flexibility and the market insights to truly cater to each customer. We are able to offer?a?one-stop-shop service and can advise?on the best solution for every specific application or market, fostering a fruitful?and personal relationship.? Inherently flexible, with global sourcing contacts, we are able to rapidly react to fluctuations in demand. Our large strategically located storage capacity gives us complete coverage when and where you need it. Our regularly audited facilities are compliant to the highest local quality systems in each country we operate in. They are compliant to ISO 9001 and rely on a fully documented and implemented HACCP system. Experienced technical sales managers, will work with you to develop and deliver sound commercial solutions. Experienced customer service advisors provide regulatory assistance and advice and will coordinate all of your development and supply chain needs.